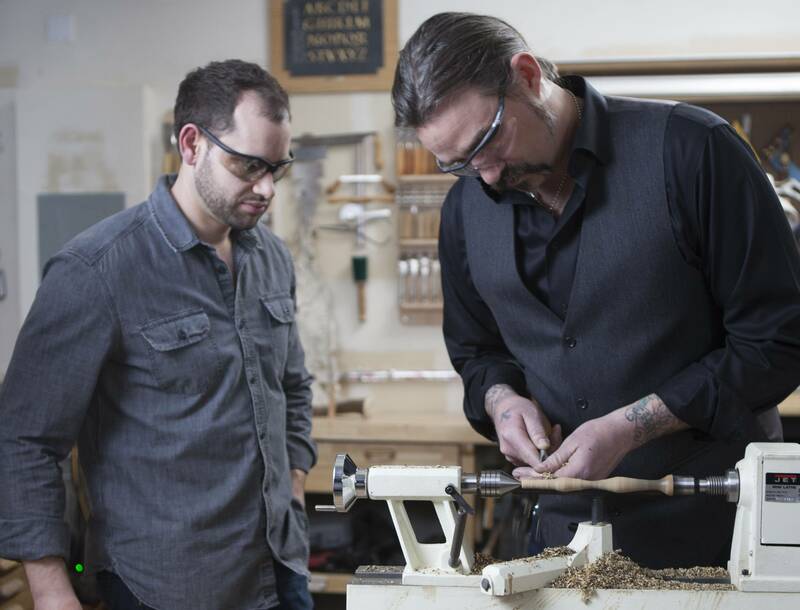 Jake Weidmann and Eric Gorges on "A Craftsman's Legacy"
A Craftsman’s Legacy, currently in its third season on public television inspiring viewers with the power of craft and American ingenuity, will feature a profile of Denver-based master pen maker Jake Weidmann, one of only 12 in the world with that title. The show's host, Eric Gorges--a renowned metal shaper and the motorcycle builder at the heart of Voodoo Choppers--continues his quest for America’s finest craftsmen in the series’ third season, documenting what it means to be a modern day maker. Traveling across the country including stops in North Carolina, Colorado, Ohio, Michigan, Nebraska and New York, Gorges visits with men and women who are carrying the tools, trade and traditions of fine craftsmanship into the 21st century. 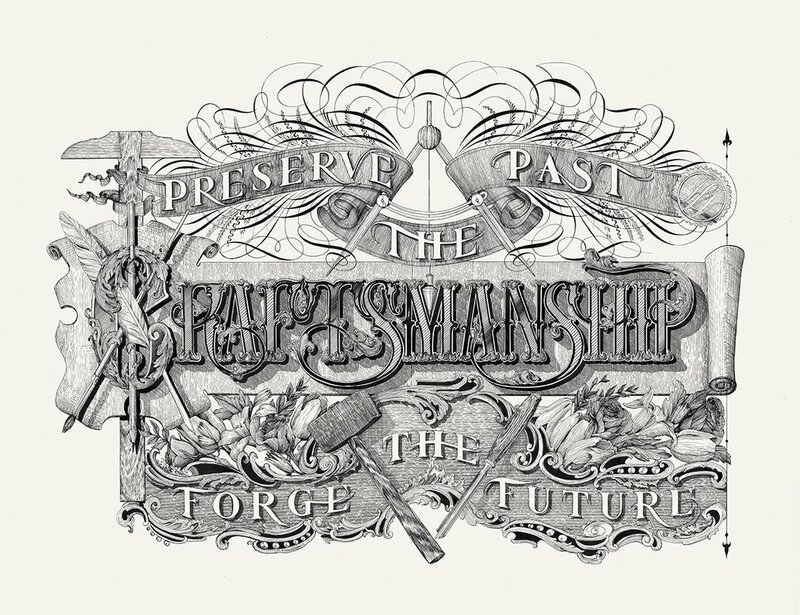 Jake Weidmann is one of an elite group in his craft – in 2011 he became only the 11th certified master penman in the world, the youngest at the time (and still one of only 12). Inspired from childhood by his mom’s beautiful cursive handwriting, and motivated as a college student by his discovery of the International Association of Master Penmen, Engrossers, and Teachers of Handwriting (IAMPETH), Weidmann explains in the episode his artistic journey. It took Weidmann just five years to achieve certified mastery of his craft, and as he explains during the episode filmed in his Denver studio, he took it a step further by learning to carve the pens used for his work, which he describes as “works of art that create works of art.” Weidmann also shares the charming story of how his craft played a central role in the courtship of his wife in today’s dating world of texts. Weidmann shows Gorges start to finish how he handcrafts elegant pens from a simple piece of wood, and teaches his guest some basic calligraphy strokes. Other episodes visit master ventriloquist puppet maker Tim Selberg; master sand caster Scott Nelles; alpaca farmer and yarn spinner Maple Smith; married chocolatiers Dan and Jael Rattigan; duck decoy master carver Ben Heinemann; Seth Gould, a tool maker doing an artist’s residency at the famed Penland School of Crafts; Native American flute maker Geri Littlejohn; master cooper Jim Gaster; master soap maker Deb Kraemer; master fly rod makers Jeff Wagner and Casimira Orlowski; and master ceramist David MacDonald. In the season finale, host becomes guest as master blacksmith Lorelei Sims apprentices with Eric Gorges as he makes a motorcycle fender. Past seasons of the series covered a diverse range of makers, including hand crafted clocks, stained glass, cheese, bicycles, and more. For more information about the series and the Legacy Society, visit www.craftsmanslegacy.com.